Everywhere I go these days I look for fire as a cooking method, and am amazed at the places it turns up. Manchester, in England, where kebabs are grilled over hardwood braziers; shwarma houses in Mexico, which use multi-shelved barbecues to roast great hunks of layered and spitted meat; southern France, where we’ve noshed on woodfired pizza from an oven high above the Ardeche River. And more down-home places like Big Oak Flat, on the road to Yosemite, where tri-tip sandwiches are available in a parking lot every Friday at lunch time. Woodfired, of course. By now, you get the idea that pizza’s only part of my passion. In fact, my original interest in building a woodfired oven was to bake bread with the kind of crust that can best develop in the fire. Now, a dozen years after the first seeds of passion were planted, I love the latitude that fire can bring to the food world, and I embrace it all. Here are some of the fiery places I’ve been. 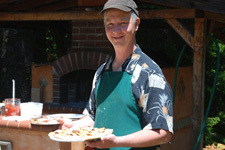 Resource in the Redwoods: Down in Redwood country, my friend Bill F. makes the kind of pizza I can only aspire to. 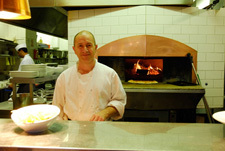 Baked in the woodfired oven he built from the ground up, Bill’s pizzas are works of art. He uses locally milled flour, the best ingredients and innovative toppings to create an amazing foodie experience. (Taking him San Marzano tomatoes was akin to my taking coals to Newcastle!) Now Bill doesn’t have a restaurant, but he does have a website that provides lots of information and is a great resource for oven owners. It even keeps a registered list of woodfired ovens. To link to his website, click HERE. And if you ever get invited to his house for a meal, GO. 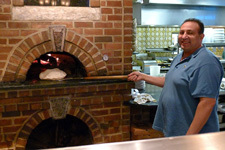 Woodfired west of Philly: In a crossroads shopping center some 30 minutes west of Philadelphia, Mary and Hamdi are partners in flame. They’re so into it that their friendly restaurant doesn’t only have one woodfired oven; it has two! Arpeggio melds Italian, Middle Eastern and Mediterranean dishes in a menu that is unpretentious and deliciously approachable. Pasta dishes, meats and fish, hummus and dips, woodfired pita or pizza – it’s all here, in a jovial atmosphere with reasonable prices. And you don’t always know what dishes Mary and Hamdi have put through the fire. When my daughter and I were invited to see their workhorse oven in the back kitchen, crab cakes were being smoke-finished. Yum! You can find Arpeggio in the Spring House Village Center or go to their website by clicking HERE. And if you happen to see my dad there, don’t be surprised; Arpeggio has become his new favorite dinner spot. All Fired Up in the Midlands: You might be amazed to find a woodfired establishment in Leicester, a bustling university town smack dab in the middle of England. But there you go: a few blocks north of the train station, just inside the ring road on Granby Street, Mauro is ready to amaze you. As often happens in England, the San Carlo restaurant is a bit heavy on the glitz. Lots of glass and chrome and waitstaff in white jackets is not my cup of tea, but once I broke on through to watch Mauro and his crew in action, I knew I was in the right place. And while the menu had fancy things like cold salmon and a beautifully arranged Coquille St. Jacques, it was the pizzas that were the real surprise. Mauro grinned from ear to ear as he showed them proudly. Not expecting to find good pizza in England? See The State of British Pizza: 2010, and you’ll be forgiven for changing your tune. Fireworks on the I-5 Corridor: Mount Shasta, the town at the base of the majestic mountain with the same name, is bookended by fire. At the Mount Shasta grocery on the north end of town, my friend Keith barbecues up a mess of chicken, ribs and beef every Friday and Saturday – come rain or shine. The flavor of his barbecue rig is so intense that you can smell it from the highway, and he told me that a good many of his out-of-town customers just follow their noses! At the other end of town, Josh is baking everything in sight at the Oven Bakery. No lie. 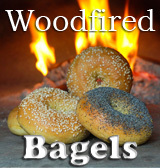 My son and I stopped in for a bagel to snack on and found that everything goes through that big woodfired oven. And when I went back the next day, I was blown away to find him and his boss Tiffany baking a cake in the oven. A cake! Are these guys into it or what?! See Beautifully Barbecued Baby Back Ribs for more on Keith’s (and Scott’s farther south) enterprises. And check back later for more info on that cake-baking technique! Learning from the Ancients: Podere Pitena, an old house near Radicondoli in Tuscany’s lush hills, has a big woodfired bread oven tucked under its kitchen. Ottavio Piccolomini and his wife are blasé about the oven: yes, it’s in perfect working order, but there’s no need to fire it up in the summer months. It would only warm up the house. Besides, you can buy bread at the local Coop; why make your own? I thought long and hard over this sentiment as I watched my kids gleefully chasing after a frantic frog that had taken Podere Pitena’s outdoor pool for a Tuscan pond. In Italy, there’s a keeper of the flame in every town as surely as there’s a drug store, a bank or a doctor. 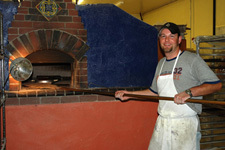 You don’t have to look very far to find a pizza place with the fire up and ready to turn out a delightful woodfired pie. And yes, at almost any grocery store, options in the bread baskets include ‘al forno’. 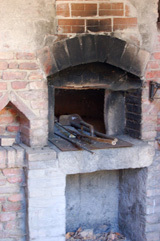 This oven, a few miles from Podere Pitena by the ruins of San Galgano, produced bread for an ancient order of monks. Despite being some 300 years old and in a decrepit state, I was amazed to hear that it still gets fired up on occasion. Impressive! Share the Love: Now it’s your turn. 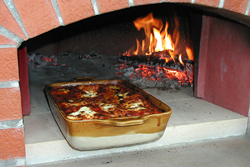 As briefly as possible, tell me about your woodfired experiences, and I’ll print your comments. Sorry, I can’t put in photos or phone numbers, but I will allow any pertinent web links. That said, if anybody out there has a photo I can use of Chris Bianca firing up his oven, I just might make arrangements! Meanwhile, I’m firing up my own oven in a few hours. I’ve got a batch of dough that’s been fermenting overnight, made with a starter piece (La Nonna) left over from the day before. As I watch the flames and feel the rush of heat, as I watch the burgeoning bread brown in the oven – I’ll feel myself drawn in by the whole event. Rubbing shoulders with pizzaioli, bakers, barbecuists and ancient Italian monks. It’s all good here. WOW! I used to live 10 mins. from Arpeggio in Springhouse,Pa. As a matter of fact I bought my second car 1 block away at Springhouse Ford. I thought I recognized the name and definitely the location. Always wanted to try there but never had the chance. Next time I go for a visit I’m sure to check it out. Thanks for the memory. 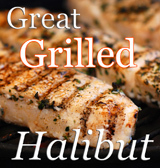 You are so right, there is nothing better than cooking over wood flame, the flavor is like nothing else. Big Oak Flat sounds like a destination I need to pencil in! Reminds me of the flat bread you find on the Adobe stoves at Indian reservations in New Mexico. Love the smell of Pinon pine burning, it has a unique aroma and just screams out Mother Earth. Cooking over wood flame was the only way my grandmother cooked back in Macedonia. We used to go to the village and just sit there and watch her do her magic! And magic it was….that food was amazing and it had everything to do with the way that it was cooked. Superb website, all I can say is spread the word.